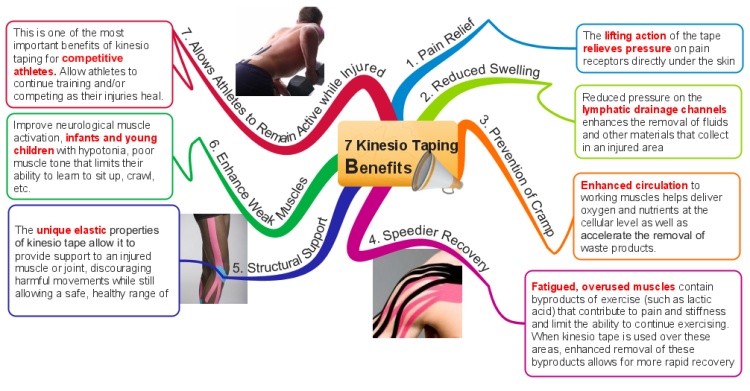 Kinesio tape is based on 'kinesiology', the science of anatomy, physiology and body mechanics. 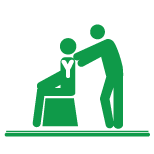 It is based on the idea that the body can heal itself, if enabled with appropriate support. Kinesio Taping provides safe support and stability to joints and muscles without affecting circulation and range of motion. The tape works well on all ages from children to the elderly, whether the injury is related to sport, work or poor posture. Kinesiology Tape is an ideal treatment option to get patients back to exercise, training, sport and general day-to-day activities faster and more effectively often within 24 hours of tape application to the skin! pain management of spinal, joint and muscle conditions, disc problems as well as migraine, tinnitus, menstrual pain, urinary disorders and lymphatic drainage. For the first 10 years since it's development in the 1970's by Dr. Kenzo Kase (a well-known practitioner licensed in chiropractic and acupuncture) because he was dissatisfied with the tape available at that time... only rigid, athletic strapping tape and another tape that had a three-dimensional stretch. Consequently, Kinesiology tape began to be used as a treatment method by many healthcare professionals from chiropractors to athletic trainers, orthopedists, acupuncturists, physical therapists, podiatrists, osteopaths and other medical practitioners alike. on his rib cage during matches. 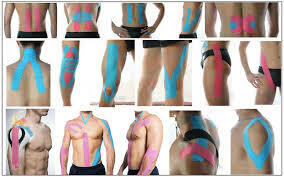 Today, Kinesio taping is used by health practitioners and athletes around the world. Kinesio taping is a unique technique based on the body’s own natural sensory functions and healing process. This taping method exhibits its efficacy through the activation of neurological and circulatory systems. This method basically stems from the science of Kinesiology, hence the name “Kinesio”. Muscles are not only attributed to the movements of the body, but also control the circulation of venous and lymph flows, body temperature, etc. Therefore, the failure of the muscles to function properly induces various kinds of symptoms which may cause degenerative conditions if not assessed and corrected early. Consequently, so much attention was given to the importance of muscle function that the idea of treating the muscles in order to activate the body’s own healing process came about. Using a breathable tightly woven cotton and polymer formulated durable elastic tape, it was discovered that muscles and other tissues could be helped by outside assistance. Employment of Kinesio Taping creates a totally new approach to treating nerves, muscles, organs and posture. The first application of Kinesio Taping was for a patient with articular (joint) disorders. The method of Kinesiology taping relies just as much on the technique of its application as it does on the properties of the tape itself. You can’t use any old tape! It’s flexible, comfortable and functional... allowing and encouraging full range of movement and can expand up to about 40 percent of its actual size! Depending on what pain you are experiencing and where, the application works differently for different injuries by supporting or restricting soft tissue and its movement. Patients have reported that initially they feel the tape working, but after a few hours they forget that they are wearing it. At Advanced Healthcare, Dr. Pisarek's choice of tape is "Mobility Pro Tape". This professional grade of tape is the world’s first and only kinesiology tape with a heat activation agent providing pain relief and support for hundreds of common muscle pain, joint, and tendon related pains & injuries. It does so by reinforcing joints with an added heat agent to relax aggravated muscles. With the dual action Kinesiology Sports Tape, it will always minimize pain and help our patients reach their true potential! Our Mobility PRO Series is engineered to perform in the harshest environments. Pro has the tenacity to last for an entire week, through multiple runs, daily showers, in humidity, cold, or in the pool. The Kinesio Taping Method is safely applied over muscles to reduce discomfort, pain and inflammation, relax overused tired muscles, and to support muscles in movement on a 24hr/day basis. It also stimulates mechanoreceptors in the skin; encourages proprioception and electromyographic activity; encourages lymph drainage and increased circulation; and, posture correction. It is a non-restrictive and longitudinally stretchable type of low-profile taping which works ideally with the skin’s natural elasticity allowing for full range of motion without feeling that it is applied on the skin. 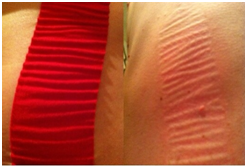 Left: red kinesio tape on skin showing wrinkles; Right: skin immediately after tape has been removed. Notice reduction in swelling (edema). The wave pattern found on the tape’s adhesive has a lifting effect on the skin which can reduce swelling and inflammation by improving circulation and reduce pain by taking pressure off pain receptor.Kinesiology tape can help with fluid movement because the elastic recoil of the tape ‘lifts’ the skin, which increases the space underneath to allow for lymphatic drainage. Your lymph system is a systemic whole-body system that helps with moving fluids into and out of the area. The lymphatic system sits just under the skin so when the tape is applied, it helps to clear an area of swelling. Increased lymphatic drainage helps with tissue healing which helps speed up the healing process. Kinesio Taping has also been shown to affect scars. Reductions of adhesions and pitting, softening, flattening, improved pliability and reduction of contractures have been seen in some patients. The health practitioner uses the tape over and around muscles in order to assist and give support or to prevent over-contraction. It is applied with varying 'percentages' of stretch to the tape to the target area or source of pain in order to create space under the skin and create the desired effect on the musculature. Applications of the tape involveutilizingsingle “I” strips or modifications in the shape of an “X,” “Y” or other specialized shapes.This affect causes changes in deeper layers of fascia by manipulating the skin and muscle, creating space underneath the skin to improve circulation and lymphatic drainage. The latex free kinesio tape, available in a multitude of colours, mimics the skin’s elasticity. It is coated with a skin-friendly wave pattern of heat-activated polyacrylate adhesive which is permeable to air reducing the risk of maceration. The wave pattern of the adhesive can support the therapeutic effect, wearing well from 3 to 5 and even up to 7 days in some cases depending on activity level and skin type. It is very durable; sports, swimming and showering present no problem due to its water repellant property. The tape can be easily removed and discarded. In contrast, traditional rigid athletic strapping tape is often tightly wrapped around a joint strictly for stabilization and support during a sporting event, for example around a boxer's wrists, obstructing the flow of bodily fluids as an UNDESIRABLE side-effect. At Advanced Healthcare, Dr. Irving Pisarek uses various professional grade high-quality Kinesio Tapes (with or without herbal botanical impregnated medication of camphor, borneol and arnica), often in conjunction with modalities of Chiropractic care, physiotherapy, low-level laser therapy, acupuncture, soft-tissue stretching and strengthening exercises, and, lifestyle education. The Kinesio Taping Method is used for anything from headaches to foot problems and everything in between. Examples include: muscular facilitation or inhibition in pediatric and adult patients, carpal tunnel syndrome, neck and lower back strain/pain (subluxations, herniated disc), athletic injuries, bruise management, pregnancy, knee conditions, shoulder conditions, hamstring, quadricep, groin injury, rotator cuff injury, whiplash, tennis and golfer's elbow, plantar fasciitis, patella tracking, pre and post surgical edema, ankle sprains, jammed/strained fingers and toes, athletic preventative injury method, and as a support method. Thelan, Dauber & Stoneman (2008). The Clinical Efficacy of Kinesio Tape for Shoulder Pain: A Randomised, Double-Blinded Clinical Trial. Journal of Orthopaedic and Sports Physical Therapy, 38 (7) 389-395. Yoshida, A.& Kahanov, L., (2007). The effect of kinesio taping on lower trunk range of motions. Research in Sports Medicine 15 103-112. Kase, K., Hashimoto, T., and Okane, T. (1996) Kinesio Perfect Taping Manual. (pp.1-10).Universal Printing and Publishing, Inc.
Martin, P. (2003). 18th Annual Kinesio Taping International Symposium Review. Tokyo, Japan: Kinesio Taping Association. Maruko, K. (1999). Kinesio Taping® with Aqua Therapy for Pediatric Disability Involving Neurological Impairment. 15th Annual Kinesio Taping International Symposium Review. (pp. 70-73) Tokyo, Japan: Kinesio Taping Association. Murray, H. (2000). Kinesio Taping®, Muscle Strength and ROM after ACL Repair. Journal of Orthopedic and Sports Physical Therapy, 30, 1. Nosaka, K. (1999). The Effect of Kinesio Taping® on Muscular Micro-Damage Following Eccentric Exercises. 15th Annual Kinesio Taping International Symposium Review. (pp. 70-73) Tokyo, Japan: Kinesio Taping Association. Rock Stockheimer, K., Kase, K., and Pillar, N. (2006) Lymphoedema and Chronic Swelling. Kinesio USA, LLC. Yasukawa, A., Martin, P., and Kase, K. (2006) Kinesio Taping in Pediatrics. Kinesio USA, LLC. please contact Dr. Pisarek at (416) 633-3000.